(TibetanReview.net, Apr01, 2018) – A woman who had for more than 18 years staged a solitary weekly protest outside the Chinese Embassy in Washington, DC, armed with a Tibetan national flag and a placard drawing attention to the Tibetan issue, has passed away on Mar 29. Grace Spring, an artist, was suffering from Alzheimer’s. Since 1988 Grace Spring had held a solo vigil every Friday morning in front of the Chinese Embassy in the US capital with a Tibetan national flag and a placard, drawing attention to the plight of the Tibetan people. 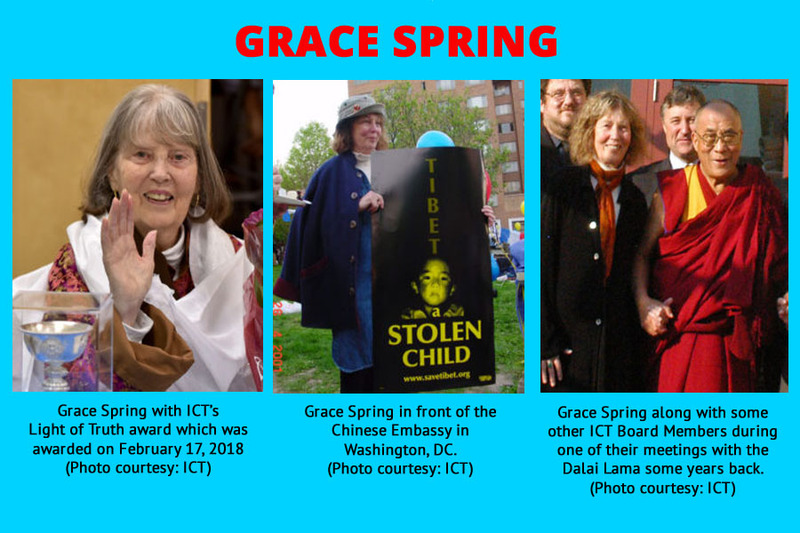 Washington-based The International Campaign for Tibet (ICT), of which she was a board member, honoured Grace with a special Light of Truth Award on the Tibetan New Year day this year which fell on Feb 17. Grace had also founded an organization for Tibet in Washington, DC, and served as a regional director of the US Tibet Committee. A resident of Washington, DC, for many years, Grace relocated, in early 2017, to Middlebury in Vermont, close to where her daughter Cassandra Corcoran resided. ICT cited Corcoran as saying that in the period before her passing away, Grace was in an incredibly happy mood.